Prefabrication and manufacturing automation technologies give builders and manufacturers extreme building and component precision with reduced cost and time. 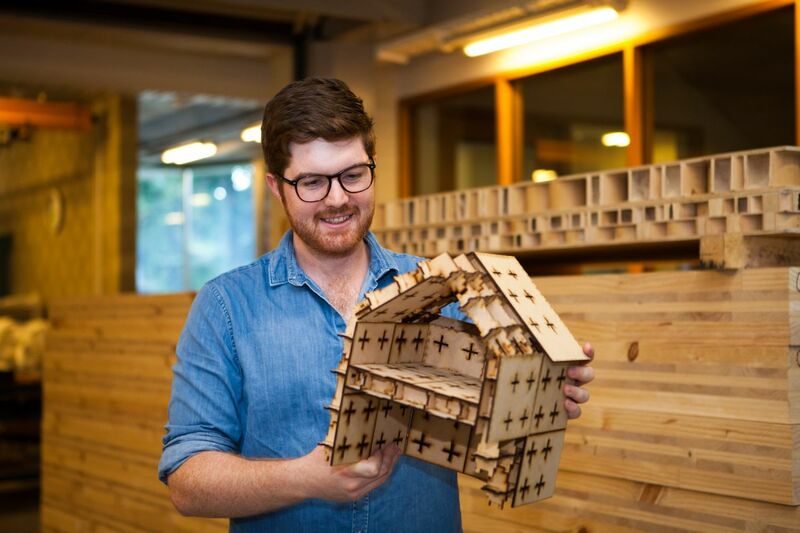 Partners in the Future Timber Hub possess expertise in digital fabrication, prefabrication, and manufacturing automation in the specific context of mass timber and tall timber construction. This project will seek to combine these three knowledge bases to develop new, beneficial structural components and systems suited for large-scale or modularised timber structures. Experimental testing on system components and suggested sub-assemblies to identify critical failure behaviours. Numerical analysis to quantify and simulate observed failure behaviours. Design and construction of a pavilion demonstrating the performance of the final system. Design and prototyping of new digitally-fabricated systems including new jointing methods for existing products and new mass timber products. Assessment of systems for market, manufacturing, performance, and construction feasibility. Testing and analysis of feasible technologies towards full-scale utilisation including experimental testing on system components and Background image suggested (TBC) sub-assemblies to identify critical failure behaviours. Pavilion demonstrating the performance of the final system.